The interests of our group are primarily in assembly of supramolecular complexes with DNA and their structural-functional characterization for elucidation of native regulatory processes and for development of nucleic acid-based diagnostic/therapeutic agents and various functional nanoconstructs. Our recent studies focus on 3D dynamics of polynucleotides and their supramolecular complexes and on regulatory roles of noncanonical DNA structures (ncDNA). We investigate sensitivity of DNA secondary/tertiary structures to external stimuli and its implications for adaptive processes. Design and assembly of nucleoprotein complexes for targeted drug delivery. Development of DNA-based tools that modulate properties of biosystems, biosensors and tools for cell manipulation and tissue engineering. Assembly of nanoparticles functionalized with DNA and nucleoprotein complexes. Investigation of DNA conformational dynamics with respect to genomic regulation and analysis of structure, thermodynamics and kinetics of complex formation between ncDNA/RNA/epigenetically modified ncDNA sites (formed upon recombination, transcription or reparation) and proteins (transcription factors, chromatin remodeling factors and others) or between ncDNA/RNA and small molecules (native and synthetic ligands to G4/IM structures) – potential drugs. Isaakova E., Varizhuk A., Pozmogova G. Cpg Methylation in G-Quadruplex and I-Motif DNA Structures. Significances Bioeng Biosci. 2018, 1, SBB.000514.2018. Varizhuk A., Ischenko D., Tsvetkov V., Novikov R., Kulemin N., Kaluzhny D., Vlasenok M., Naumov V., Smirnov I., Pozmogova G. The expanding repertoire of G4 DNA structures. Biochimie. - 2017; 135 54-62. Vlasenok M., Varizhuk A., Kaluzhny D., Smirnov I. Pozmogova G. Data on secondary structures and ligand interactions of G-rich oligonucleotides that defy the classical formula for G4 motifs // Data in Brief. - 2017. Chuvilin A.N., Smirnov I.P., Mosina A.G., Varizhuk A.M.Pozmogova G.E. A Solution to the Common Problem of the Synthesis and Applications of Hexachlorofluorescein Labeled Oligonucleotides. PLoS ONE. - 2016; 11 (11): e0166911. Posypanova, G.A., Chuvilin, A.N., Kireeva, N.N., Severin, E.S. and Pozmogova, G.E. (2008) Complexes of telomeric oligonucleotides with the PGEk protein vector: Internalization by target cells and antiproliferative activity. Molecular Biology, 42, 253-260. Pozmogova, G.E. and Chuvilin, A.N. (2007) Principles of creation of protein carriers of DNA new derivatives of human epidermal growth factor for gene therapy. Bulletin of Experimental Biology and Medicine, 144, 457-463. Besschetnova, I.A., Pozmogova, G.E., Chuvilin, A.N., Shchyolkina, A.K. and Borisova, O.F. (2006) Complexes of telomeric oligonucleotide d(TTAGGG)4 with the new recombinant protein vector PGEk carrying nucleic acids into proliferating cells. Molecular Biology, 40, 433-439. Pozmogova, G.E. and Knorre, D.G. (1998) Protein and peptide constructions for DNA and oligonucleotide delivery in cell. Voprosy Meditsinskoj Khimii, 44, 335-337. Tatarinova, O.I., Gorokhovets, N.V., Makarov, V.A., Posypanova, G.A., Serebryakova, M.V. and Pozmogova, G.E. (2010) New protein vectors based on an alphafetoprotein fragment for targeted dna delivery into cancer cells. Vestnik Rossiiskoi Akademii Meditsinskikh Nauk, 3-8. Borisenko, G.G., Zaitseva, M.A., Chuvilin, A.N. and Pozmogova, G.E. (2009) DNA modification of live cell surface. Nucleic Acids Research, 37. Позмогова, Г.Е. (2012) Искусственные ДНК-содержащие супрамолекулярные комплексы. Palmarium Academic Publishing. Pozmogova, G.E., Chuvilin, A.N., Smirnov, I.P., Zaitseva, M.A., Tatarinova, O.N. and Govorun, V.M. (2008) Preparation and Properties of Associates of Nickel Nanoparticles with ss-DNA and Proteins. Nanotechnologies in Russia, 3, 391-396. Tatarinova, O.N., Smirnov, I.P., Safenkova, I.V., Varizhuk A.M. and G.E., P. (2012) DNA complexes with Ni nanoparticles: structural and functional properties. Jopurnal of Nanoparticle Research, 14. Zaitseva, M., Kaluzhny, D., Shchyolkina, A., Borisova, O., Smirnov, I. and Pozmogova, G. (2010) Conformation and thermostability of oligonucleotide d(GGTTGGTGTGGTTGG) containing thiophosphoryl internucleotide bonds at different positions. Biophysical Chemistry, 146, 1-6. Pozmogova, G.E., Zaitseva, M.A., Smirnov, I.P., Shvachko, A.G., Murina, M.A. and Sergeenko, V.I. (2010) Anticoagulant Effects of Thioanalogs of Thrombin-Binding DNA-Aptamer and Their Stability in the Plasma. 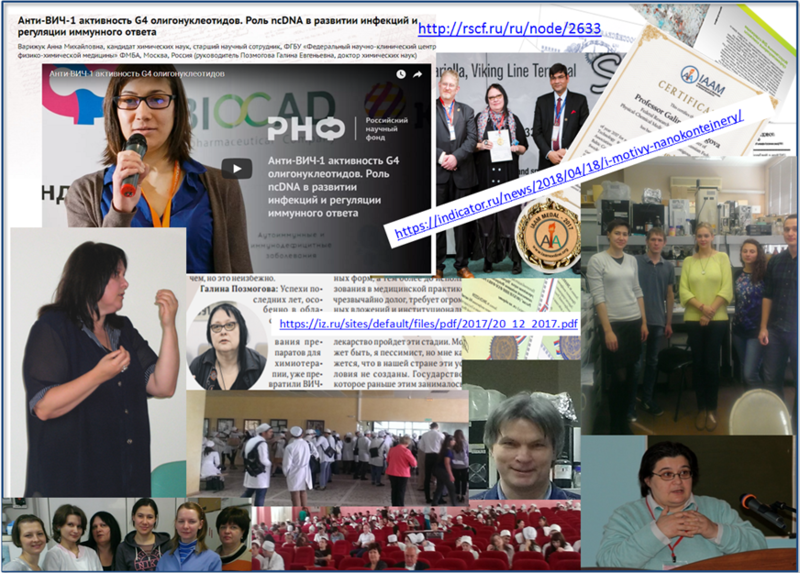 Bulletin of Experimental Biology and Medicine, 1-5. Shchyolkina, A.K., Borisova, O.F., Livshits, M.A., Pozmogova, G.E., Chernov, B.K., Klement, R. and Jovin, T.M. (2000) Parallel-stranded DNA with mixed AT/GC composition: Role of trans GВ•C base pairs in sequence dependent helical stability. Biochemistry, 39, 10034-10044. Smirnov, I.P. (2011) UV MALDI for DNA Analysis and the Developments in Sample Preparation Methods. Springer Science. Borisova, O.F., Shchelkina, A.K., Il'icheva, I.A. and Pozmogova, G.E. (2001) [Conformational polymorphism and extensibility of DNA quadruplexes formed from d(GT)n repeats]. Mol Biol (Mosk), 35, 860-867. Varizhuk, A.M., Tsvetkov, V.B., Tatarinova, O.N., Kaluzhny, D.N., Florentiev, V.L., Timofeev, E.N., Shchyolkina, A.K., Borisova, O.F., Smirnov, I.P., Grokhovsky, S.L. et al. (2013) Synthesis, characterization and in vitro activity of thrombin-binding DNA aptamers with triazole internucleotide linkages. Eur J Med Chem, 67C, 90-97. Chuvilin, A.N., Serebryakova, M.V., Smirnov, I.P. and Pozmogova, G.E. (2009) Byproduct with altered fluorescent properties is formed during standard deprotection step of hexachlorofluorescein labeled oligonucleotides. Bioconjugate Chemistry, 20, 1441-1443. Tatarinova, O.N., Lukyanova, T.N., Zaitseva, M.A., Veremeev, K.Y., Karpov, V.A., Chuvilin, A.N., Petrunin, D.D. and Pozmogova, G.E. (2008) Significance of methods for purification of oligodeoxyribonucleotide probes for the efficiency of gene diagnosis by real-time PCR. Bulletin of Experimental Biology and Medicine, 145, 312-316. Luk'ianova, T.A., Zaitseva, M.A., Karpov, V.A. and Pozmogova, G.E. (2008) The synthesis and mass spectrometry of oligonucleotides bearing thiophosphoryl modifications of the predetermined localization. Bioorganicheskaia khimiia, 34, 83-88. Северов, В.В., Варижук, А.М. and Позмогова, Г.Е. (2012) Перспективы использования методов клик-химии в медицине. Эфферентная и физико-химическая медицина, 1. Varizhuk, A., Chizhov, A., Smirnov, I., Kaluzhny, D. and Florentiev, V. (2012) Triazole-Linked Oligonucleotides with Mixed-Base Sequences: Synthesis and Hybridization Properties. European Journal of Organic Chemistry, 2173–2179. Varizhuk, A.M., Kaluzhny, D.N., Novikov, R.A., Chizhov, A.O., Smirnov, I.P., Chuvilin, A.N., Tatarinova, O.N., Fisunov, G.Y., Pozmogova, G.E. and Florentiev, V.L. (2013) Synthesis of triazole-linked oligonucleotides with high affinity to DNA complements and an analysis of their compatibility with biosystemsonucleotides with High Affinity to DNA Complements and an Analysis of Their Compatibility with Biosystems. J Org Chem, 78, 5964-5969. Vladimir B. Tsvetkov, Alexander V. Serbin Molecular dynamics modeling the synthetic and biological polymers interactions pre-studied via docking: anchors modified polyanions interference with the HIV-1 fusion mediator. Journal of Computer-Aided Molecular Design 2014 June, Volume 28, Issue 6, pp 647-673. Tsvetkov VB, Solov'eva AB, Melik-Nubarov NS. Computer modeling of the complexes of Chlorin e6 with amphiphilic polymers. Physical Chemistry Chemical Physics. 2014 Jun 14;16(22):10903-13. Galina Pozmogova, Vyacheslav Severov1, Anna Varizhuk, Igor Smirnov, Alexandra Sekridova, Vladimir Tsvetkov. Secondary DNA structures in G/С-rich microsatellites. Investigating the equilibrium between G-quadruplexes, Imotifs and duplexes. FEBS Journal Volume 281, Issue Supplement s1, Article first published online: 27 AUG 2014. P. 639-640. Galina Pozmogova, Maria Tankevich, Andrey Dezhenkov, Anna Varizhuk, Igor Smirnov, Yulia Kirillova Kirillova. A new type of peptide nucleic acids derived from L-Glu. FEBS Journal Volume 281, Issue Supplement s1, Article first published online: 27 AUG 2014. P. 632. Vladimir Tsvetkov, Anna Varizhuk, Galina Pozmogova New parameters for describing conformational rearrangements in G-quadruplexes. FEBS Journal Volume 281, Issue Supplement s1, Article first published online: 27 AUG 2014. P. 401. Anna Varizhuk, Maria Prokofjeva, Vladimir Tsvetkov, Vladimir Prassolov, Sergey Mikhailov, Galina Pozmogova. G4-DNA inhibitors of HIV entry. FEBS Journal Volume 281, Issue Supplement s1, Article first published online: 27 AUG 2014. P. 743.